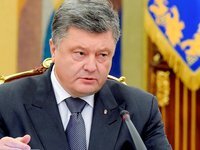 President of Ukraine Petro Poroshenko considers illegal the intention to announce early elections to the Verkhovna Rada. "Hints of an early and absolutely illegal attempt to dissolve the Verkhovna Rada in case of a change of president do not say about stability. Such appeals have already been made," said Poroshenko at a meeting with business representatives in Kyiv on Monday.